Popular Indian designers have come up with boutiques in major cities. That is the right place for you to shop for the latest Punjabi clothes online. Visit boutiques in your town to get to know about the latest trend before buying. You can buy branded attires online if you don’t find the best place to shop nearby. Boutique's Ensembles always offer elegance to show off your personality. Now famous designers have their own online shop. Every woman doesn’t have the identical physique; so, the same type of clothing for all is impossible. You need to consider your skin tones and structure type to identify what colors and clothes best for you. WHAT TYPE OF LATEST PUNJABI DESIGN WILL FIT YOU? In India, salwar kameez dupatta is most popular ranging from casual to ceremonial wear. The origin of this traditional salwar kameez is the land of Punjab. Nowadays, Punjabis are more popular than Anarkalis. Everyone loves it because it comes in trendy designs of collar, neck, back, and sleeves. Punjabi people have many traditional references; like music, folk dance, actors, cuisine & fashion. You must have some basic know-how about the trending fashion trend. You must assess your body structure before planning for shopping. Complexion also plays a vital part to choose appropriate color tones. In apple shape, hips & shoulders are almost equal and a bit wider waist. If you are apple shaped than, perhaps your legs and arms must be attractive. Your bust might be very feminine. You must intend to balance your waist as well as display your most beautiful part of the body. You must fill your closet on the base of this logic. Dark Heavy 3d Punjabi suits new style thread work; Kadai & embroidery will prove a decent choice like a lifeline. Some hipline long v-neckline jackets are must and should for you. Designer salwar-kurta with a firm fit upper part & swinging hem in a stable stiff fabric will do magic for you. Try kurta (tunic) with flat front straight pant, as it will look great on you. Even shoulders and waistline (Almost) along with wider hips is the structure of pear shape. You must draw attention towards the upper part of your body and keep away from the center part. Pear-shaped female must go for, light color top and dark bottom to maintain balance. Vivid colors, prints, and heavy neck will drag attention toward your kameez and keep away from the hip. Embellished backline and neckline will fit more to the pear-shaped frame. Go for a well-embellished cap, dropped sleeves or quarter sleeves with puff cuff. A deeper, more plunging neckline & boat neckline works best for a pear-shaped frame. Square Bardot, bateau, boat and cowl are also best necklines. These will draw attention towards the upper part of your frame. Go for vivid colored, off-shoulder hugging kurta with floor kissing dark color pant. Knee length neon color collar necked A-line kurti salwar is also a nice option. If you have a broader hip line, you must choose a layered long kameez suit design. Try long bright colored embellished empire waist kameez with puffed quarter sleeve and a boat neck. Rectangle frame type is well known as skinny, banana, H-shape, stout figures or boyish frame. You must have uniform bums, a slight small bust-line, and straight shoulders. Your waist must be the cutest part of your figure, Your upper back or neck might be slightly bulky. Women having straight figure must choose closed neckline with back zip or buttons. Pleated Patiala salwar suit design is the best option for you. Pure white or off-white Punjabi can be the best choice for your rectangle shape type. Designer party wears suits with dropped waist will enhance your look. Your structure is wider shoulders, wider than waistline and hips. Your weight is on around broad & straight shoulders, larger chest, trunk & back, and flat bums. Your cutest chunk is your waistline and legs and non-favorite ones are above it. Embellished Light or bright color front pleated trouser will enhance your look. Go for a dark color fitted jacket with latest 2018 designs of Punjabi with laces. Try soft and drapery dark color shrugs over Stylish new Punjabi suit design with laces. Current fashion trend’s tunic length Indian Punjabi churidar kurta is another way to show legs. Experiment with a blending of dark waterfall color kameez and light or bright color straight pant. Heavy hips and shoulders (even) along with well-defined small waistline means hourglass shape. You must have round bums & round and sloping shoulders. You might have full thighs, narrower than the lower hips and cute cleavage. Your intention must be to draw attention by displaying your cute waistline. A-line is worth for you, A-line Punjabi kurta pajama in a free-flowing fabric is a right choice. Long outfits with highlighted neckline are preferable for ladies with an hourglass shape. Salwar suit coupled with dupatta is the best option for an hourglass. A loose outfit with ample room around the chest is for you. You must have designer dresses with v-neck, round neck or boat neck in your wardrobe. You can appear like a diva in layered outfits. Your intention must be to create an illusion of a tall look. You should avoid wearing flares and trail lengths. Must stay away from puffed sleeves and opt lace or net with minimal embroidery. You should choose the dark shade of maroon to create an illusion of a taller look. Vertical stripes are best for short ladies. A short female can look stunning in laced tops coupled with Churidars. You must have kurta with allover vertical stripes decorated done with laces. You must go with a chevron (zigzag) pattern. When choosing color combinations, you must consider your height. Light color combinations are perfect for short height female. For plum females, a mixture of flower prints or big vertical prints is the best choice. You must keep certain things in mind at the time of picking up the modern trend. Don’t buy cheap suits online because the quality of the lace and fabric will not be innovative and fresh. You must go for latest Punjabi salwar suits new designs online shopping at a reasonable price. It is a long topic let us understand in brief. Curvy hips, fuller breasts, flabby backs or heavier waistline are signs of a fat body. Too plump curvy woman (plus size) would have surplus lumps at either tummy or thighs. You can also look excellent. Be an expert on your physique subject and believe in your mastery. The right choice of getup will help to balance bulks of your heavy structure. Make sure that you choose the best pattern that hides your curves and uplifts your personality. Light colors are for you to draw attention towards your best part of the body. You can obscure your non-preferred features with dark colors. Go for contrast color combinations according to thumb rube. Avoid large prints and go for small prints. Self-patterned or printed vertical or diagonal stripes will flatter your bulky part. Dual shades are best for you. Must go with a loose shaped top with square neckline will make you look slim. You must choose dark color knee-length Punjabi kurta to pair with Patiala salwar. Fill your wardrobe with full-sleeved trendy lightweight outfits. You must prefer to go with chevron (zigzag) pattern printed salwar kurta. A combo of Black & pink kurta pajama with embroidery designs will look outstanding on bulky ladies. You structure must be one of the above-mentioned types. Believe in being naughty at forty. You must attend every social gathering in a grand way. Your intention must be to look young and energetic. With changing time, the approach is changing from traditional to stylish clothing. Women in their middle age prefer crafty embroidered getups. It helps to look younger and remain fashionable at different events. If you are 40 plus must go for Indian traditional ladies Punjabi dress models online shopping. Many women who are above 40 prefer wearing north Indian party suit. They like to get up at various festivals, occasion, marriage, and engagement ceremonies. Indian Gown is an alternate option for you. A middle-aged woman must have a collection of stylish but sober clothes in her wardrobe. Every youth want to look different than others. Young ladies and girls love to wear a unique outfit. They have only one common question in their mind. "What type of dressing style will go well with me?" Current fashion trends clothes will apt for young ladies and girls. Young females love to wear an uncommon new trend's clothes. Most females prefer traditional wears for weddings, mehendi, reception, and festivals. You must update your closet with Beautiful modern Punjabi salwar kameez design. A young lady who wants to look cute should always pick a frock pattern. You can find frock pattern Patiala salwar kurta with frills and pleats. We would like to share some latest fashion clothing type with you. When it comes to buying quality, shape and the current trend should go hand in hand. No one shows interest to put on outdated fashion wears, as everyone needs an updated wardrobe. Many famous fashion brands are introducing in India. Many prefer buying stylish Punjabi suits online boutiques. Boutique's products are always made up of high-quality fabric. One must fill the wardrobe with outstanding patterns to stand out from the crowd. You will get personalized attention, each time you go for buying. Ladies Punjabi suit design latest full long salwar kameez is an ideal choice for you. Till today, the traditional jacket is 1st choice of Punjabi and Haryanvi females. The traditional jacket comes in short length with embroidery and striking string patterns. Such jackets come with pretty patterns for slim girls to look stunning and gorgeous. Pseudo jackets are also available that come pre-attached with Punjabi kameez. They come with lovely shapes and shade's combination. Heavy embroidered and mirror worked jacket will make slim girls look attractive. Good-looking females can show-off their beauty by putting on traditional dresses with jackets. The thread work on jackets makes it unique ethnic wear. There are huge collections of jacket style ensembles in different shades. You must choose an appropriate color combination that apropos your skin tone. North Indian garments are quite popular, and many ladies love to have them in their closet. 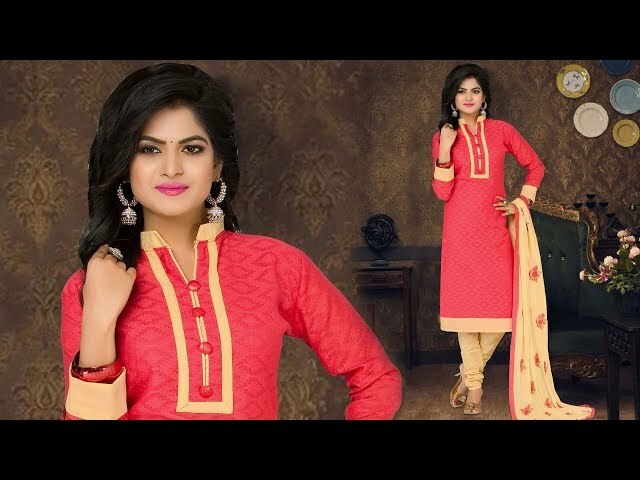 Trendy costumier salwar kameez, a new style of Punjabi suit for ladies is a great choice for gathering. Today, you can find a wide collection of new fashion’s beautiful designer Punjabi suit for girls with low price. These styles will make you look fashionable at functions. New style's beautiful couturier salwar suit with classy embroidery & laces work is the best for parties. Experienced dressmakers take care when creating embroideries and handwork job. Now a day’s embroideries have become machine work. Latest Indian fancy worked heavy ladies party wear are best for occasions. These ethnic wear also comes with a full flare from the abdomen up till bottom. Best Punjabi suit new design with simple hand-worked palazzo pant works well in case of a hurry for sudden meetings. Don’t think twice about picking a kurta with palazzo trouser. They offer comfort as well as fashion. Buy online modern fancy Punjabi suit party wear for women who are always in a crunch of timing. Dupatta plays the most important role in enhancing the look of Punjabi. Punjabi Dupatta comes with various types of decorations. Punjabi Dupatta with Phulkari embroidery, laces, thread, and traditional motif works are unique. Plain Punjabi suits the latest design with heavy dupatta & fancy jacket are handy for insistent necessity.